Who doesn't like a hot bowl of soup on a cold winter evening? This is the perfect time to feed loads of different types of soup to your family. 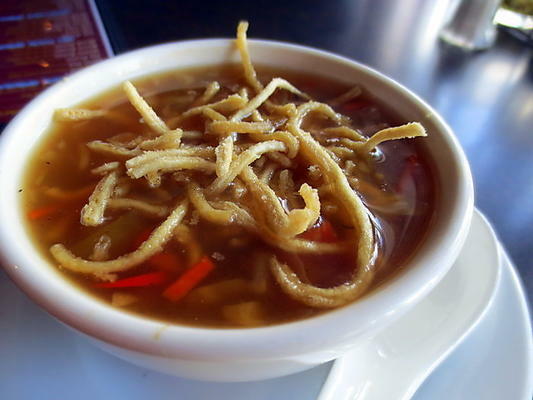 One particular favorite in India is the Manchow soup, which is easy to cook, and spicy to the buds. Capsicum, Cabbage, Spring Onions, Carrots, Green Chillies, Ginger and Garlic: All chopped finely. Button Mushrooms and Chinese Mushrooms, also chopped finely. Soy sauce, chilly sauce, oil and vegetable stock. Cornflour, salt and Fried Noodles. - Start by heating oil in a wok. Add the shopped ginger, garlic and spring onions to the wok. Lightly fry these before tossing in the veggies and the mushrooms. - Now chop the bamboo shoot and add to the wok along with the green chillies. - It's now time to add in the vegetable stock and start stirring. Now also add in the two sauces. Mix cornflour in water and add to the boiling soup along with salt. - Wait for the soup to thicken. Garnish with fried noodles and serve hot!